or automatically in case of a detected burst pipe*. Detects drip leakages on the cold water system and alerts you. How can I stop leaks and reduce water damage to an absolute minimum at home? If you are one of the 54% of households who have experienced water damage at home, you’ll know what a hassle and an expensive nightmare it can be. That’s why GROHE introduced GROHE Sense and Sense Guard – a complete water security system for your smart home that lets you not only detect but also stop water leaks before they cause greater water damage. How does GROHE Sense Guard reduce water damage? Early leak detection is key to limiting water damage in your home. GROHE Sense and Sense Guard offer a complete leak detection/water security system that monitors temperature and humidity to alert you of the tiniest leaks, all via the GROHE ONDUS app. And with Sense Guard, you can also shut off your water supply automatically in case of detected leaks, or even remotely when traveling, giving you total control of leaks and flood damage in your home. A water damage clean-up can be costly, stressfull and heart-breaking. Instead let GROHE Sense Guard give you the power to switch off your water supply automatically or remotely, when it detects abnormal water consumption. Reduce and even prevent water damage and the danger of a flood, even when you are on holiday, with the GROHE Sense and GROHE Sense Guard wireless water security system – the smart home solution you can trust. 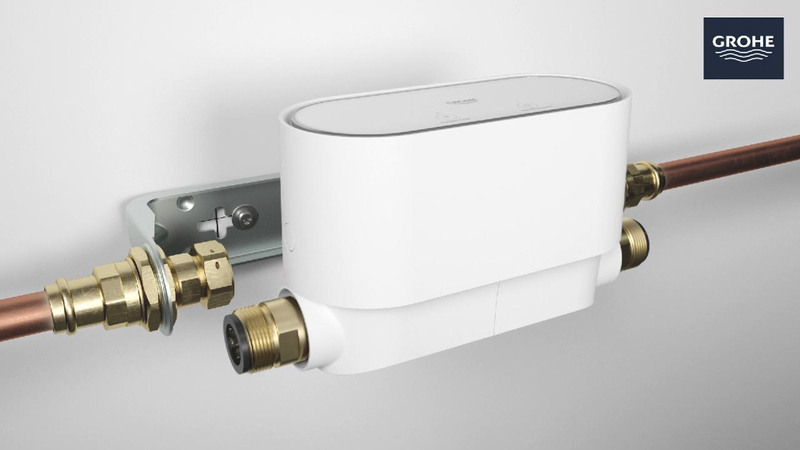 With GROHE Sense Guard the moment it detects a pipe break, AquaBlock shuts off the water supply. Moreover, GROHE Sense Guard sends you a notification via the GROHE ONDUS app in case of a detected leak – whether it is a micro leak** or a burst pipe*. GROHE Sense Guard senses the system temperature where water enters your house and gives you early warning of the risk of incoming frost water. No surprises at the end of the year… finally you have transparency over your water consumption. Check your app and track daily water consumption. Connecting Sense Guard to Nest enables an even higher level of water security by shutting water off every time you leave home. Communication of the home/away status from Nest makes it possible to automatically shut water off, either immediately or with a time delay (e.g. if you leave washing machine on). Upon returning home, water is automatically turned back on. The burst pipe*, which results in 65% of water damages in Germany - and enormous cost. When GROHE Sense Guard detects a pipe break, it automatically shuts off the water supply. The dripping tap that loses one drip per second can waste more than 11,000 liters per year. That is enough water for more than 180 showers! GROHE Sense Guard detects even small amounts** of water loss, so you can find the issue and get the leak repaired. The leaking pipe, which together with leaking taps, showers or toilets, cause 28% of water damage. Often minimal in size, these small leaks can go on for years, completely saturating walls or floors over time and causing extensive damage. When GROHE Sense Guard detects the leak, you can get it repaired fast. Detects a pipe break, automatically shuts off the water supply and alerts you. Shuts off the water supply either manually or automatically in case of a detected pipe break*. Detects drop leakages and alerts you. Detects unusual water consumption and alerts you. Detects if the incoming water could cause frost and alerts you. Be informed about humidity and save your house and property from potential harmful consequences of humidity. Water remains available in case of a power cut. It’s a simple matter to install GROHE Sense and GROHE Sense+ all round your house. However, we recommend that you use the services of a professional installer to install GROHE Sense Guard. For the installer, the job is easy and fast: in about an hour, your home is much safer.